Artists are asked to work on a poster space approximating 8” x 10”, and the art should represent a theme associated with the Roots & Rhythm festival, such as music, Wayne County or railroading. Honesdale is the birthplace of the country’s first commercial steam locomotive to run on rails—the Stourbridge Lion. A replica of the Stourbridge Lion can be seen in the Wayne County Historical Society building on Main Street in Honesdale. The poster deadline is May 4th, 2015. Blank posters may be picked up and finished ones dropped off at Camp Umpy’s, 622 Main Street in Honesdale, during the bagel shop’s business hours, 6am – 2pm. On the day of the festival, the posters will be displayed in Artist’s Row and a silent auction will be held. All posters upon receipt become the property of Honesdale Roots & Rhythm Music & Arts Festival and all funds raised go towards the festival. 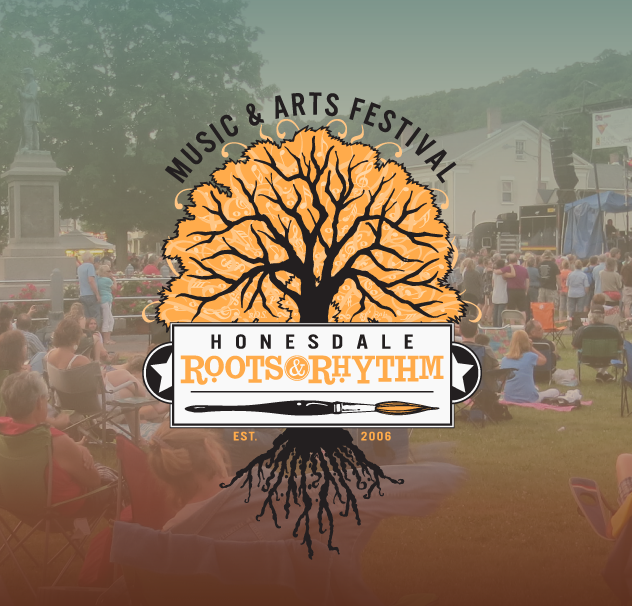 Honesdale Roots & Rhythm Music & Arts Festival, a 501 (c) (3) tax-exempt organization, reserves the right to use all posters in the future for various fundraising opportunities. PROCEEDS WILL HELP KEEP THE MUSIC ALIVE IN HONESDALE!